Pag or Rab. These islands are world famous for their beauty, mediterranean climate and rich tourist offer. But being a land of thousand islands, Croatia hides treats for those eager for an ideal vacation away from the crowds of tourists. This little island of a short and unusual name is placed between islands Dugi Otok and Ugljan in the Zadar archipelago. You can get to Iž from Zadar with a ferry, catamaran or a boat. The fastest way is by the catamaran (around 50 minutes), and slowest is by boat (around 1h and 30 minutes). The island is rich with beaches stretched across the coast and very close to houses and apartments. meter high hill Korinjak. The most populated place is Veli Iž, a picturesque village in the very center of the island. While you're there visit the local ethnographic collection in family Fanfogna's summerhouse dating from the 18th century or the renovated church of saint Peter and Paul. Like every island, Iž also has its fešta (a local celebration), the Iška fešta when, at the end of July or beginning of August, you can see the locals dressed in traditional costumes dancing old dances and preparing homemade food. Also don't miss the ancient island custom – coronation of the king of Iž. To make your vacation on Iž even more authentic, get up at dawn and go to the very center of the village where you can buy freshly caught fish from the local fishermen. with a catamaran. Because of its distance and influence of the sea, summers on Lastovo can be less hot than in other parts of the Adriatic and the winters are milder than average. Come to the centre of the island and you'll find there the hidden medieval town of Lastovo where you can sightsee the church of saint Kuzma and Damjan and lots of interspersed mediterranean houses. Pick one of the apartments or rooms in our accommodation offer on Lastovo and make the best of this island. Explore the interwoven cycling and walking roads many of which lead to beaches and coves. 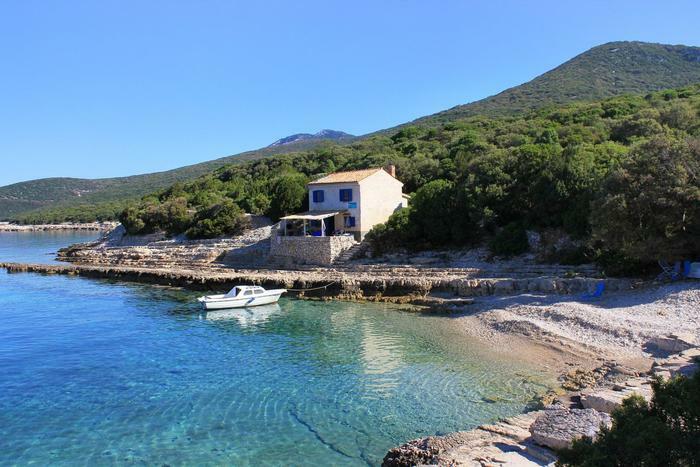 Dive around Bijelac islet or just soak in the peace and quiet of this island while reading your favorite book. The northern Adriatic hides many less known islands. One of them is Susak, known for its sandy structure, arhaic language and unusual colorful folk dress. You can get to Susak with a catamaran from Rijeka in 4 hours, but you can also get there with a local ferry from Mali Lošinj on Lošinj island. The peak of your visit will definitely be Spjaža, the sandy beach in Donje Selo where you can rent out beach chairs and enjoy many water sports. Because of its long shoal it's ideal for families with children and older persons. But prepare yourself for lots of walking because Susak is an island without roads and cars. Climb the stairs that connect Donje Selo to Gornje Selo and sightsee Gornje Selo's stone churches. So, if you want to give in to the magic of this sandy island, book an accommodation on nearby Lošinj. We recommend you visit Susak in the afternoon hours since it's a sandy island there are almost no trees there. But if you still intend to visit Susak in the morning hours put on lots of sunscreen, bring a bottle of water and a hat. Island Šipan is just seventeen kilometers away from Dubrovnik. Old gentry left a lasting imprint on this island that was their summer retreat – as many as 42 summerhouses are strewn across the island while there are also 34 medieval, renesance and baroque churches. Still, the island is so badly populated that it entered the Guinness Book of World Records for being an island with more olive trees than people. Book your accommodation in Dubrovnik and while you're on your vacation set aside a day for a trip to Šipan. Get on the ferry and sail away to this oasis of peace. Either by bike or on foot, discover its rich historical heritage, lone beaches and hidden coves. This unjustifiably ignored island is placed between the far more visited islands of Brač and Hvar. You can get to Šolta by catamaran from Split in 30 minutes, while it will take you an hour of travel with a ferry. Šolta's pebbly beaches in hidden coves on both the south and north side of the island invite divers to explore the depths of its sea. Besides, they're ideal for families looking for a peaceful spot for basking in the sun while the thick pine wood invites you to explore it by walking or cycling. Those of you with an exquisite palate will love red wine made of Šolta's native grape sort dobričić, olive oil or Olintio – honey made of rosemary. Šolta's cultural summer offer is rich in diversity. Hang out with the locals at the local festa Užežin sv. Ivana Krstitelja, watch local theatre plays, jazz and blues bands, and at the end of July be a part of an unusual event – Tugging of Mrduja – when boats representing Šolta and Brač tug this small island located between them. This lovely manifestation is based on a legend that says that people from Brač and Šolta would always fight about whose island is Mrduja and then would tie it with a rope and tugg it each to its own side . So, if you want to spend a peaceful but active vacation on Šolta, book an apartment or room from our offer. Book an apartment or room in Šibenik and while you're there don't miss to explore the islands of the Šibenik archipelago, especially island Zlarin, also known as the pearl of the Adriatic. Zlarin is proud of the longest island promenade in Croatia, with a length of 130 meters. Without the usual car smoke (cars are not allowed on Zlarin), Zlarin is perfect for sightseeing on foot. Visit the little church of saint Roko or the church of st. Šime (Simon) turned into museum. Or just walk along the pebbly beaches situated on the left side of the quay and discover renaissance villas of Zlarin's old gentry. If you're on Zlarin at the end of July, for a taste of traditional music visit the Fingac cove where the Bodul balad – an evening of songs dedicated to Zlarin – takes place.